This race caught my eye last year after I had run UTA 50km. 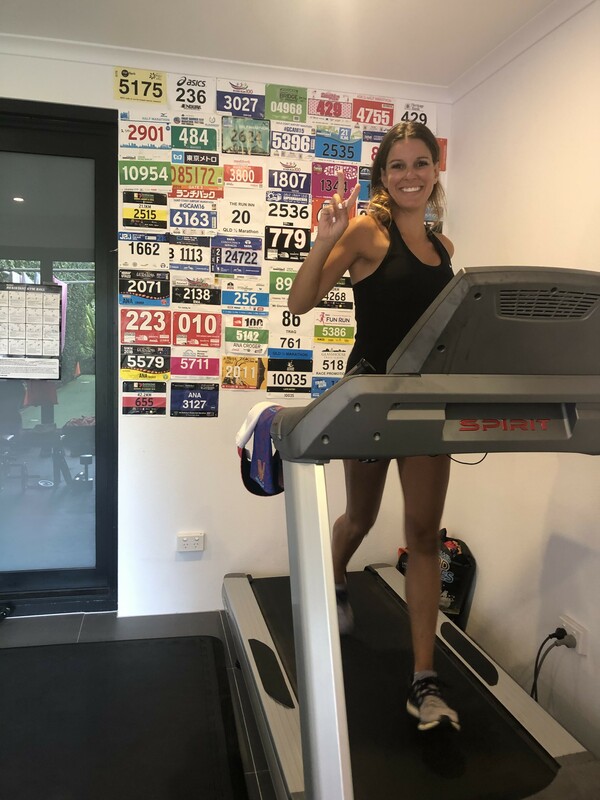 I recall wondering if it was a good one to do prior to a 100km and my research said no, that Hounslow is a truly brutal undertaking. (How right that was!) I decided to set my sights on UTA100 in 2018 instead. Despite much self-doubt I went on to run UTA100 after a consistent 8 months of training. I had such a great time and paced myself so well, that I felt it actually didn’t challenge me as much as I’d hoped. I was very happy, but I’d prepared to dig really deep, I wanted to experience those dark moments of pure grit (crazy I know) but it wasn’t like that. So very nervously, I entered the 68km / 4480m elevation Hounslow Sky Ultra Marathon. 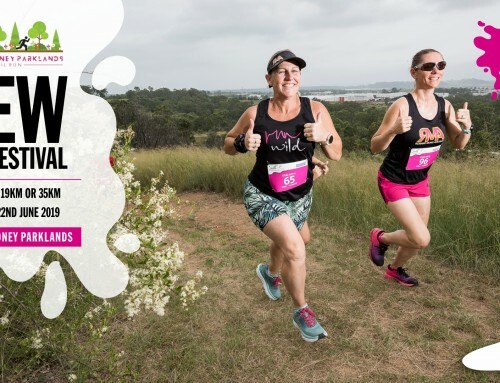 A month after UTA, I headed up to Blackheath to check out the 21km Sky Run course. After getting lost and realising just how technical the trail is, I felt scared. Those big climbs were not going to be the only issue! I joined the Hounslow Sessions Facebook group and signed up for some guided training runs. This proved invaluable, taking the pressure of navigating and meeting some other fabulous people crazy enough to run these trails. I learnt lots of training and race day tips and felt very encouraged to just keep training. Thanks Tony! 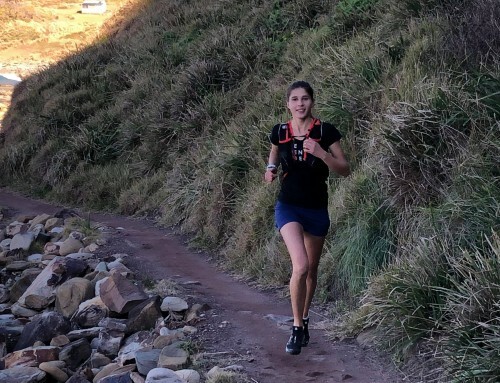 My preparation was moderate, though I did manage 6 on course runs, multiple stair sessions in the gym and lots of technical trail practice on my local trails. I only managed 2 of the course’s 4 huge climbs and descents in one day though and I’d hoped for 3, so I prayed I’d done enough. The photos I have of the course are all from training. The week before the race I started becoming very nervous. I prepared my gear, started packing and tried to stay calm. I was convinced I hadn’t trained enough. The last few weeks I’d had a pain to the left of my groin, and a horrifically tight ITB and I’d had to taper down way more than usual. At least I was well rested. 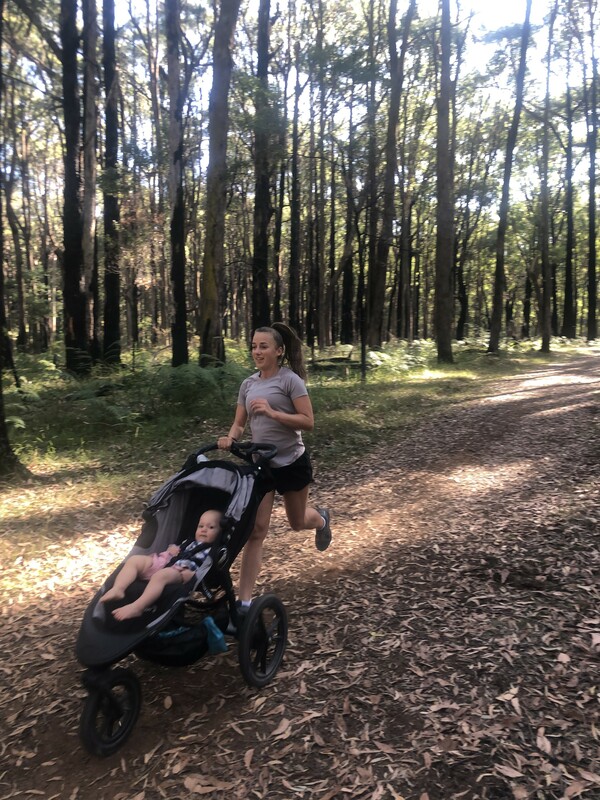 On the Friday before race day I drove up to Blackheath with my family, checked into a sweet little cottage and headed over to Allview Escape for race check in. As we walked down the driveway, and I saw the stunning view of the cliffs, I felt so overwhelmed and choked back tears. I picked up my number and didn’t hang around, as I needed to calm my anxiety and try to get a grip. Back at the cottage I laid out my gear, and realised I’d forgotten to take my drop bag when I did check in. That is so unlike me and I felt a little rattled. After a quick chat with Reece (hubby and crew) about what I’d prepared in the crew bag, I went to bed and tried to get some sleep. At 5am I woke up feeling fresh and started getting ready. I’d decided to tape my ankles as a precaution (I’d rolled the right one in training on course), but I just couldn’t seem to do it right. I was so jittery. Reece, who is always a calming influence on me, made me another coffee and got the kids up and ready. I almost forgot my drop bag again and thankfully Reece reminded me. This is when I found the lovely RMA Caz who was volunteering, collecting the drop bags. I felt happy knowing Caz would take good care of my bag! It was quite warm already, much warmer than I’d expected and I got Reece to grab my visor, as I knew I wouldn’t be wearing a buff at all this morning. Before I knew it we were off, first a loop of the Allview property to spread us out and then down onto the rocky single track towards Govett’s Leap. I started at the very back where I’m comfortable, going out nice and easy. The little group I was with for the first couple of kms were moving slightly too slowly, but I wasn’t worried. I did pass after about 3km though and ran freely from then on. This section has stairs up and down and it’s easy to overlook them, I kept the effort easy and enjoyed the views, knowing this would be a very long day. It was warm and I was sweating already so I text Reece quickly to say I wanted to change from my t-shirt into a singlet after this first loop. Staying relaxed I ran straight past the aid station at Neates Glen 7km. That little section is flat and runnable but then plunges down lots of stairs into the Grand Canyon and I love this part. It gets dark, there’s water and ferns and is just beautiful. I was focused though, no slipping or tripping today. I was alone for quite a few kms, and though I was paying careful attention to the course marking, at one point I realised I hadn’t seen pink tape in awhile. I checked the map on my phone, it looked like I was fine so I continued on and reminded myself to pay attention, but also not second-guess myself too much. I caught up to a few people, passing them comfortably. I ran well through the technical landslide section that I really hate and managed to not get lost at the boulders that always confuse the hell out of me. I did slip on a wet rock though, bashing my knee and seeing the first blood of the day. I was fine but it was a good reminder to be careful. I was happy when I reached Junction Rock, the lowest point of the loop and one of the four big descents of the race done. This is where the climb begins, albeit gradually at first before becoming very steep. It’s about 4km to the top and I wanted to make it a nice steady effort. I used my poles for a couple of km in the middle of the climb here to help save my legs for later. I do prefer to climb with my hands on my knees though. At the top I felt tired, but that’s just what these crazy climbs do to you, so I fast walked until I recovered and started running again back to Allview and Checkpoint 1 where Reece and the kids would be ready. I’d fueled every 30min so far with bits of Cliff Bar, Shot Bloks and Gels and had drunk a 1.5L of electrolyte already. I arrived at CP1 in 3 hours 52 minutes; I’d aimed for 4 hours so that was perfect. I picked up 3 bottles, 2 with electrolyte and 1 with tailwind, my food for the next leg, my sunglasses and earphones. I didn’t end up changing into a singlet as I could feel a bit of a breeze. Reece had everything laid out ready and I headed out again in only 6-7 minutes. I felt a little bit emotional, the reality of how hard this day would be had hit. My mother in law Judy, who is a big support, reassured me that I was doing well. I knew the next leg would be tough though, I grabbed a vegemite sandwich went into to my little bubble. This next leg started off well, I felt relaxed running along the single track to Pulpit Rock lookout, and then up onto road and down the dirt road to Perry’s Lookdown. This is the only wide, non-technical section of the course, the runnable stuff isn’t my strength so I just did my best. I quickly filled one small bottle as the other 2 500ml were full. A volunteer checked if I needed anything else and warned that although short in distance, the next check point was 2-3 hours away. I’d run this in training so assured him I was fine and waved them off, in hindsight I should have filled my bladder. The descent from Perry’s Lookdown is 2.4km of steep rocky stairs. I find the first km a bit scary and I took it cautiously, but also aware that the descents done well can make up lots of time without much effort. There was another woman in front of me and she was so great on this section so I just tried to keep up. The race leader and eventual winner passed by here on his way back up. It was inspiring to see how fast he was moving! At the bottom is the beautiful Blue Gum Forest, with only about 500m of smooth single track before crossing the river over a huge fallen tree. It was very warm so I wet my hat and buff, squeezing water over my head and back to cool down before climbing across the big dead tree and starting the brutal climb up to Da Faur Head and across to Lockley Pylon. I started without poles to begin with, but used them a little in the middle before putting them away again as it gets technical and I like to scramble with my hands. The views here are incredible but this section was hot, and very hard. It’s actually a bit of a blur, I had still been fueling well every 30min, but on the climb I adjusted this to every 20min and it helped a lot. I had Shotz gels and Clif Shot Bloks and was rationing my fluids that were running out fast. That had me slightly concerned. I was moving slowly but staying calm, reminding myself that at the top there will be a cool breeze and I can recover. I put one earphone in with music and went back into my bubble. I tried to breath in through my nose and out through my mouth to stop it getting too dry. As I climbed the steep rocky single track, the faster runners were making their way back down, they were all so polite but I was more than happy to step aside, taking a quick breather while letting them pass. The women’s leader Lou Clifton came past here and I was excited to cheer her on as she went by. I continued up the cliff, at what felt like a snails pace yet somehow catching and passing a few more people. The views here seriously are the best I’ve ever seen and it’s very high. At the top I started to run, I was just about out of water but still had a few kms to the Pinnacles Aid Station at the 34km halfway point. Somewhere along this section a cramp began inside my right thigh. I don’t cramp often so it wasn’t a great sign, I got out a couple of salt tabs and put them under my tongue. I also got my poles back out to take some of the strain off. It settled down and thankfully didn’t come back. I ran and fast walked, cheering on runners coming back in the opposite direction, it helped my mindset a lot and helped distract me from my water situation. This section dragged on and on, it’s rocky and sometimes very loose underfoot and it’s easy to trip and fall. Where the hell was the turnaround? I could feel vomit rising as I ran and prayed it stayed down. Everyone kept telling me it’s not far, nearly there. Some of the ladies I met during training passed me here, Kirsty, Liz, Ali and Margaret and I was so happy to see them all doing so well. Finally I made it to the aid station and for the first time ever in a race, I sat down on a chair. There was a gear check, the fabulous volunteers filled up my bottles and my bladder and I drank 2 cups of coke. It tasted so heavenly. I calmly fixed up my pack, visited the loo (TMI I know but my period had started mid race, something us ladies just have to deal with, but seriously, mid race?!) I was halfway, well under the cut off now and feeling good. Unfortunately there were a few people who had to DNF whilst I was there and I felt so bad for them. I quickly got on my way, my pack felt so heavy and my shoulders were hurting but I was not risking running out of water again. I sent Reece a text that I was leaving so he knew where I was up to. As I headed back I took in the scenery, the light was really beautiful in this part of the afternoon. I remember having a big smile and soaking it all up. I also remembered I was about to do my third big descent for the day! Excited, I pressed on. This section went very well and despite it being very steep and already almost 8 hours on my feet, I descended faster than I had in training. My stomach now felt fine, I was still fuelling to schedule, and decided on the next climb back up Perry’s I’d increase it again. This is the toughest climb of the day; I got my poles out and started to climb steadily. It’s back up those 2.4km of steep rocky stairs, it’s insane, and a slog the whole way that ended up taking me 55 minutes. I high fived a volunteer at the Perry’s Aid Station at the top, I was beyond happy to make it there. I now knew I would finish this race and I cried a little bit. I had some more Coke and hiked out up the road feeling determined. I sent Reece another text that I was on my way. He text me back something encouraging. I ran and fast walked my way along the road back to Pulpit Rock and then ran the single track back to Allview for the last Checkpoint. I could hear my kids already and had to laugh. It was 5:15pm, I was 2hr and 15min under cut off! There was no celebrating though, I was happy, but I was in some kind of battle mode. This was very hard work. I got more food, filled my bottles and had some red bull. My boys were running around like lunatics and clearly having a ball. Again Reece had everything ready for me, I put on my headlamp and grabbed my arm sleeves in case in got cold. I was a bit grumpy here because I just wanted to get going. I couldn’t think very clearly and I was probably not making a whole lot of sense. The light was fading fast and the last descent begins with very steep, slippery stairs and I wanted to get down as far as I could with some daylight. I ran off, yelling out to the boys that I’d see them in a few hours. They were eating the chocolate that I couldn’t stomach so they were happy. There were 2 guys with me here, one in front and one behind. It made the final descent less scary. I looked out at the sun setting; this course really is as equally stunning as it is brutal. The view from here was wonderful. I could feel the top of my left knee hurting, and I kept apologizing to the guy behind me but he kindly assured me I was doing fine and he didn’t want to pass. Eventually I stopped and told him to pass me, I just needed to slow down a little. It was dark now and I was using a brand new headlamp I wasn’t overly familiar with, I prayed it would work for me through till the finish. (I know, I know, nothing new on race day but where’s the fun in that). I ran along solo in the dark, I had some music in one ear to keep me sane and then came across 4 runners all standing on the track. They were worried they hadn’t seen pink tape in a while and I told them there are long sections like this where there aren’t any junctions. We checked the map, found we were on track I passed them and continued on. I surprised myself at my confidence, I’d been very afraid of running this course in the dark. I came to a water crossing and slipped, falling between 2 rocks and taking little chunks out of my knuckles this time and seeing the second blood of the day. It hurt but there was nothing I could do about it so just kept running and told myself to be more careful on the wet rocks in the dark. I ran and hiked solo through the dark, I kept thinking I could hear footsteps but no one was there. I also thought I could hear a woman’s voice at one point but in hindsight I think it was just echoes in the valley. The section is the same 21km loop as the first, but done in reverse. I was told to expect it to take me up to an hour longer and I definitely found this direction much harder. As I started clambering up the landslide section, I struggled on the uneven sandstone, at times couldn’t get my footing. I had my poles out but had to put them away as I needed my hands free to crawl and scramble. I accidentally stood up too quick and bashed my head on an overhanging rock above. It really hurt and I wanted to cry. My dark, dig deep moment had arrived. I continued on, telling myself I’d be in the nice section of Grand Canyon soon, just keep moving. I had kicked my toes painfully a few times and had put one earphone in to perk myself up but I wasn’t even listening to the music. I could feel that painful blisters had started on my heels. Eventually things got a bit easier again and I was running a bit but hiking lots. I was still eating and my tummy felt good. I realised I’d had no more cramps and that made me more positive. I tried to calculate how far to go and what time it was but I couldn’t work it out. My watch was showing a lot more kms so I just ignored it. I came across a couple other guys in the final bunch of stairs and passed one of them. We were all very quiet, just silently climbing and climbing. The stairs seemed endless and my legs were like lead, and then there it was, the top, with 2 volunteers standing there in the dark the poor things. I was so happy to see them. I ran now, I couldn’t wait to get to the Neates Glen Aid Station as that would mean only 7km to go and also more Coke. When I saw the glow and heard some cheering I was so happy. I cried a little bit again, I was so tired and I was really going to make it now. The beautiful volunteers gave me coke, I had a lolly snake and they led me and the another guy out in the right direction. He was running really well and I lost sight of him. I ran when I could and fast walked when I needed to. Then there were more stairs! I’d forgotten about these ones. It was exhausting but I didn’t stop. I focused on getting to Govett’s Leap first to break it up. When I saw that carpark I was ecstatic, cried again to myself and ran as fast as I could manage. It dawned on me here I was going to finish in under 15 hours and I could hardly believe it. This last loop I’d completed in 4:30! I felt really good and when I reached the last little section I pushed as hard as I could. Seeing the gate that leads up to the Allview Escape property and the Finish Line felt indescribable. I ran to that finish line crying with happiness and finished in 14:47! This is by far the most difficult race I have ever had the privilege to run. I went into this wanting a challenge and to really test myself and it certainly delivered. I must thank the volunteers because they were an incredible source of support and encouragement during a very tough day. To anyone who has looked at the Hounslow Sky Ultra and contemplated entering, please do give it a go. You must train and prepare yourself, and the cut offs are a bit tight but it is well worth the pain I assure you!